A pair of robot rovers have landed on an asteroid and begun a survey, Japan’s space agency said Saturday, as it conducts a mission aiming to shed light on the origins of the solar system. The rover mission marks the world’s first moving, robotic observation of an asteroid surface, according to the Japan Aerospace Exploration Agency (JAXA). 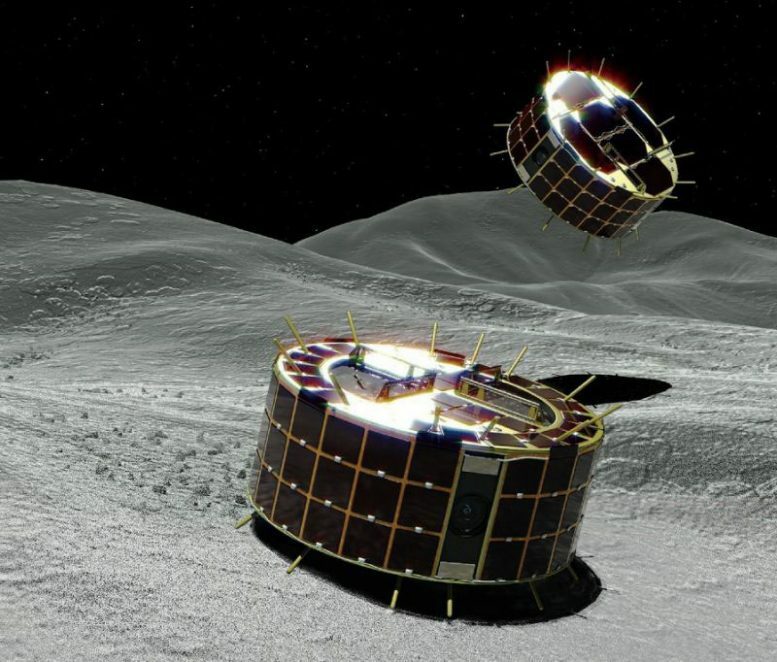 The round, cookie tin-shaped robots successfully reached the Ryugu asteroid a day after they were released from the Hayabusa2 probe, the agency said. “Each of the rovers is operating normally and has started surveying Ryugu’s surface,” JAXA said in a statement. Taking advantage of the asteroid’s low gravity, the rovers will jump around on the surface — soaring as high as 15 metres (49 feet) and staying in the air for as long as 15 minutes — to survey the asteroid’s physical features. “I am so proud that we have established a new method of space exploration for small celestial bodies,” said JAXA project manager Yuichi Tsuda. The agency tried but failed in 2005 to land a rover on another asteroid in a similar mission. Hayabusa2 will next month deploy an “impactor” that will explode above the asteroid, shooting a two-kilo (four-pound) copper object to blast a small crater into the surface. From this crater, the probe will collect “fresh” materials unexposed to millennia of wind and radiation, hoping for answers to some fundamental questions about life and the universe, including whether elements from space helped give rise to life on Earth. The probe will also release a French-German landing vehicle named the Mobile Asteroid Surface Scout (MASCOT) for surface observation. Hayabusa2, about the size of a large fridge and equipped with solar panels, is the successor to JAXA’s first asteroid explorer, Hayabusa — Japanese for falcon. That probe returned from a smaller, potato-shaped, asteroid in 2010 with dust samples despite various setbacks during its epic seven-year odyssey and was hailed as a scientific triumph. The Hayabusa2 mission was launched in December 2014 and will return to Earth with its samples in 2020. 1 Comment on "Hayabusa2 Rovers Successfully Land on Asteroid Ryugu"
Congratulations Japan for successfully landing on asteroid! Amazing scientific and engineering accomplishment!